Holidaymakers looking to find a nice quiet retreat in a beautiful location will not find many better places than the Yorkshire Dales. Located in the North East of England, this is a fantastic area of the country with beautiful countryside, traditional market towns and quaint villages but still only a short drive from larger cities. Here visitors will find numerous different places to stay including self catering accommodation, holiday cottages, guest houses caravan parks and camp sites. The Yorkshire Dales is a great location for hikers, cyclists and horse riders with many trails to be found in and around the area. Some of the finest limestone scenery can be found in the Yorkshire Dales making this a popular area for caving and potholing. Visitors here will also find numerous places to try some fishing with Bessy Beck Trout Fishery just one of many options. This is an excellent part of the country to take a golfing holiday as there are so many courses located here including in Richmond and Catterick. Fun days out can be had at Lightwater Valley Theme Park & Shopping, which boasts the longest rollercoaster in Europe. Weekend breaks are also available for budding super sleuths with companies arranging murder mystery holidays in North Yorkshire. 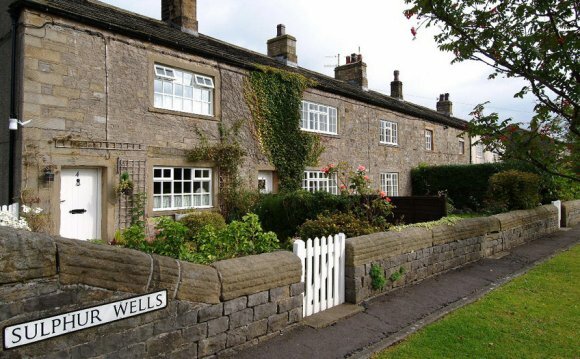 The Yorkshire Dales has many villages and towns with quaint eateries such as cafes, tea shops and public houses. Larger places such as Harrogate have a mixture of restaurants, bars and pubs serving food from many different parts of the world. Visitors can buy local produce from local markets and arts and crafts from small boutiques in the towns and villages. Bigger centres like York, Richmond and Harrogate feature some larger well known high street stores. Holidaymakers may like a night out at the theatre and several towns in the Yorkshire Dales can accommodate this such as Harrogate and Skipton. Horse racing enthusiasts can enjoy a day out at some of the courses located nearby such as Catterick, Ripon and York. Several museums and galleries feature here too including the Prison and Police Museum in Ripon. The city of Ripon also has a wonderful cathedral, or if castles are of interest then Ripley can satisfy this curiosity. The warmest time of the year to visit the Yorkshire Dales is generally July and August when the average high is approximately 20 to 21 degrees centigrade. The driest months of the year tend to be May and July while December and January is the wettest time of the year with between 70 and 90mm average rainfall per month. Leeds-Bradford International Airport is the closest airport to the dales and has flights to and from several European countries such as France, Germany, Greece, Ireland, Italy, Turkey and Spain as well as domestic flights from Belfast, Edinburgh, Glasgow and London Gatwick amongst others. There are direct daily train services to and from London King's Cross, linking Yorkshire with the capital city in less than three hours. Regular bus routes run through the dales but due to the country roads these can take a while.. North Yorkshire is accessible from the UK's motorway network, with the M6 heading west, the A66 to the north, the A1 to east and the A65, A65, A59, A629, M62 and M65 to the south.